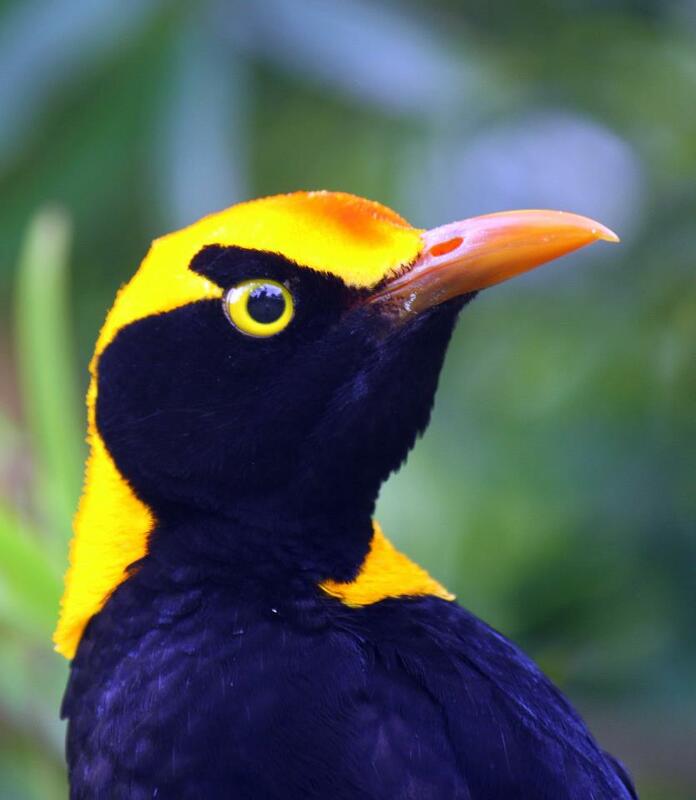 Regent Bowerbird. Is this Australia’s most spectacular looking bird? This trip report – well, it’s more of a summary of the birds there than a trip report really – covers the spectacular Lamington National Park. Without question, is one of Australia’s premier birdwatching locations. The park, which is about 20,000 hectares in size, is located in southern Queensland,120 km west of Brisbane, and 85 km west of the Gold Coast. Generally when I’m visiting Lamington, I travel in via one of the the two major access point – Green Mountains and Binna Burra. Both of these are near major guest house lodges. On the east side of the park there is the Binna Burra Mountain Lodge, reached via Binna Burra Rd from Beechmont Rd. On the west side, in an are known as Green Mountains, is O’Reilly’s Rainforest Retreat, reached via Lamington National Park Road via Canungra.Both lodges provide superb, albeit but somewhat expensive accommodation. The national park camping area is located at Green Mountains section, 200 m from the park’s information centre. Binna Burra Mountain Lodge also runs a camping area adjacent to the Binna Burra section of the park. Rainforest along the Coomera Track. Lamington’s vast forested region contains Australia’s largest preserves of pristine sub-tropical rainforest, being one of the major upland subtropical rainforest remnants in the world and the most northern southern beech cool temperate rainforest in Australia. The park ranges from palm filled valleys with waterfalls and crystal clear rivers to mist covered tops (1100 metres) clothed in cool temperate rainforest dominated by Antarctic Beech trees. 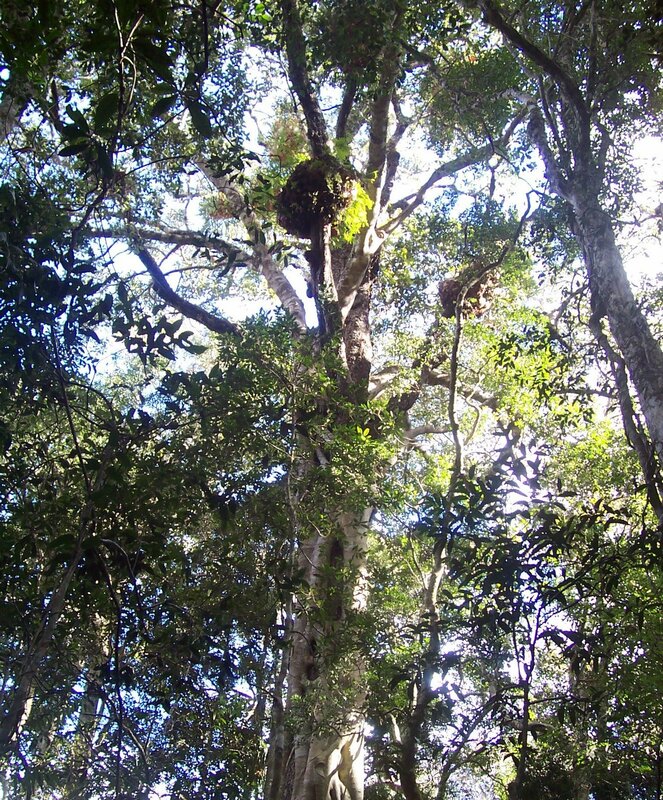 Amazingly the root system of one the oldest Antarctic beech trees has been measured at being over 5000 years old. With a myriad of ridges and cliff lined valleys, Lamington sits on a plateau that consists of the remains of a vast ancient volcano, the remnant core of Mount Warning. 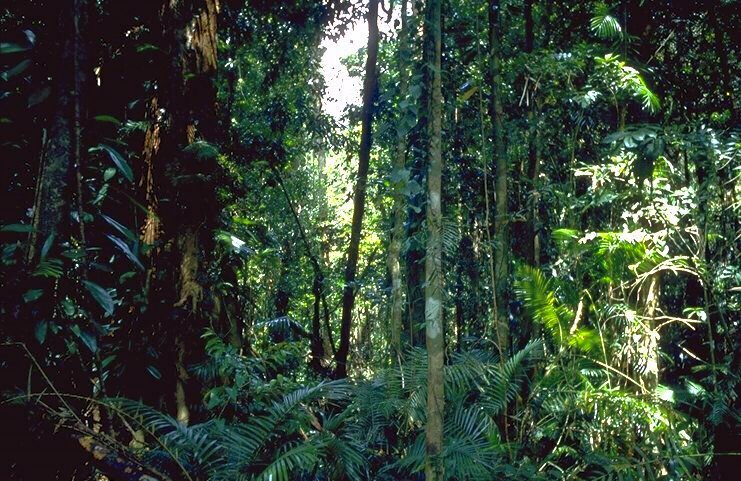 The central core of subtropical rainforest is bordered by a variety of other typical Australian vegetation types and the diversity of plants and animals reflects this. For example, Lamington boasts over 160 bird species, 900 species of vascular plants, and 70 mammal species. Wompoo Fruit-dove. Image Greg Oakley. 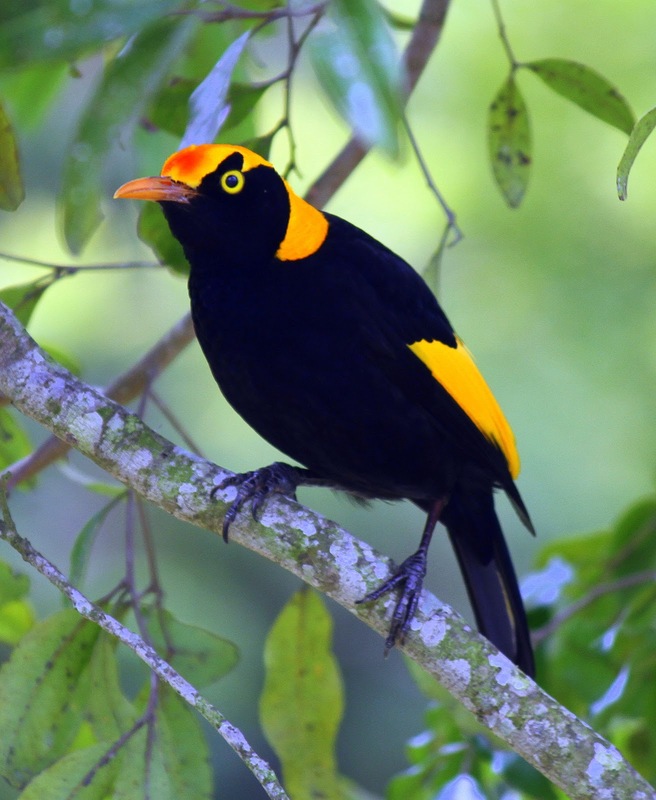 listen for their distinctive walk to work call), Regent Bowerbird, Russet-tailed and Bassian Thrush, Eastern Whipbird, and robins such as Pale Yellow, Rose and Eastern Yellow. 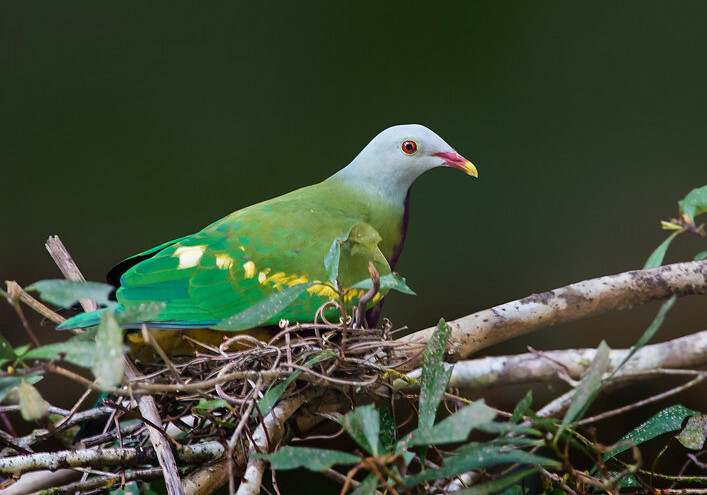 Some of the exotic pigeons here include Brown Cuckoo-Dove, Emerald Dove, Rose-crowned, Superb and Wompoo Fruit-Dove, and Wonga, White-headed and Topknot Pigeon. In spring and summer you get a return of migratory species such as monarchs such as Spectacled, Black-faced and White-eared Monarch, Rufous Fantail, and White-throated Needletail. 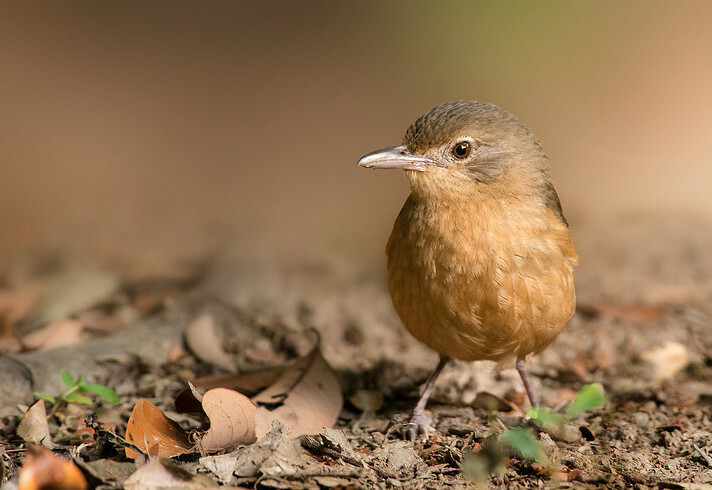 For birders, one of the most sought after species at Lamington is the rare and elusive Rufous Scrub-bird. When walking in Lamington in July 2007, I had good views of this species along the Coomera Circuit (which starts near the Binna Burra Kiosk). This was 4 km down Coomera Circuit, in a patch of grassy heath immediately behind the first rocky lookout. The best way to find them is to listen for their very load penetrating call, used to advertise their territory (typically about 1 ha in size), particularly during the breeding season. The call will ring in your ears if you stand too close. Perhaps the main trail for looking for Rufous Scrub-bird is along the Lamington’s famous Border Track. It follows the border between NSW and Queensland along the top of the McPherson Range, linking Binna Burra to the O’Reilly’s guest house at Green Mountains. The total walking distance of is about 21 km, so it’s not short/ From a birders perspective it generally takes 7 to 8 hours to complete – this allows you time to stop and look at your target species along the way. From either end they can usually organise transportation back to the side that you’ve come from. Check with the lodges for details. Most of the Border Track is subtropical rainforest, although there are occasional sections where Antarctic Beech is very prominent. Some of the trees are estimated to be 4,000 years old. Concentrate your search the skulking Rufous Scrub-bird in areas of Antarctic Beech particularly where there is grassy, heavily-grown understorey. Specifically, probably the best area to looking is between Mt Bithongabel and Mt Merino, and then along the Mt Merino loop. From Binna Burra, Mt Merino is reached by following the Main Border Track past Joahlah Lookout to the foot of Mt Hobwee and then west to the base of Mt Merino itself. Once you’ve reached the Mt Merino Track, which leads off to the left, about 400 m up the you come to the excellent Beerebano Lookout. From here the track continues to the summit and the spectacular Merino Lookout, where there is Antarctic Beech at the very top. Rufous Scrub-bird occur around the summit. Double-eyed Fig-Parrot. Image Greg Oakley. There are also records of ‘Coxen’s Fig-parrot’ at Lamington – the southernmost subspecies (ssp coxeni) of the Double-eyed Fig-parrot. It is one of the rarest and least known parrots in the world. Since it was described by John Gould in 1866 (he named it after his brother-in-law, naturalist Charles Coxen), it has been seen fewer than 200 occasions. At Lamington the only two species it could be confused with are Little and Musk Lorikeet (both uncommon species in the park) – Fig-parrot are distinguished from these two species by their dumpier build, seemingly tail-less silhouette and more rounded wings. Your only real chance of seeing one is when they are flying, due to the habit of foraging quietly quietly in the very top of large rainforest trees. 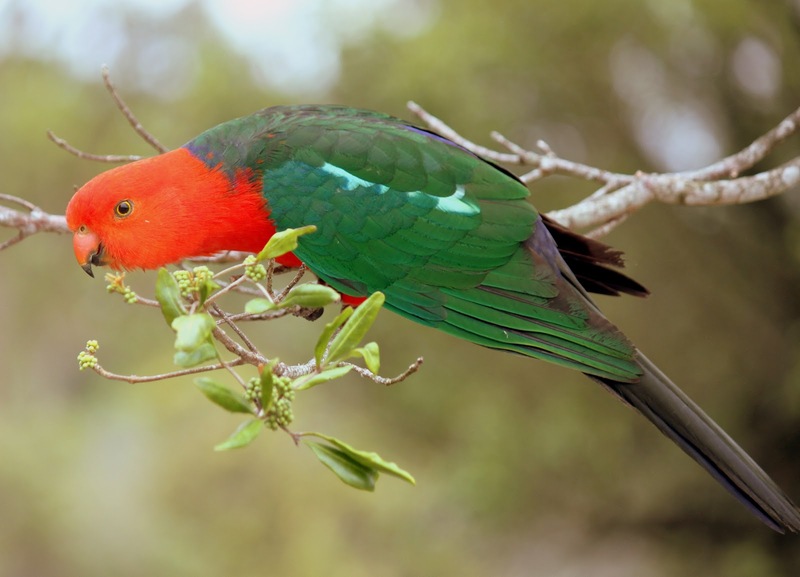 In flight, they give a flight call, which is harsher, more staccato than Little and Musk Lorikeet, resembling a series of short, detached musical notes. With a size of about 14 cm, it is also Australia’s smallest parrot. 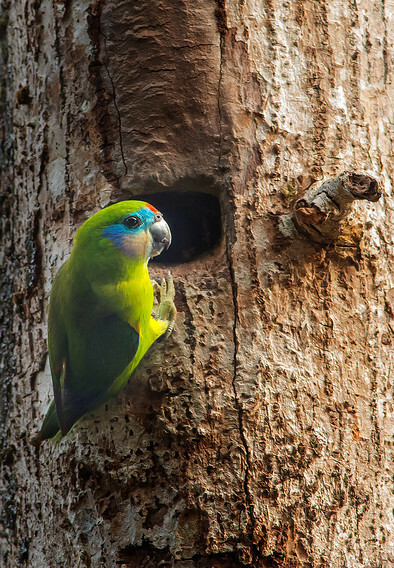 If you are fortunately to see or hear what you think is Coxen’s Fig-parrot, report it immediately to the Coxen’s Fig Parrot Recovery Team (after you’ve given me a call!). Well known tracks include the Box Forest Circuit (10.9 km, 4 hr return from O’Reilly’s), Toolona Creek Circuit (17.4 km, 6 hr return), and the Albert River Circuit (20.6 km, 7 hr return to O’Reilly’s). It is also worth having a look at Python Rock Lookout (excellent for Albert’s Lyrebird in wetter areas and Red-browed Treecreeper in drier areas) and Morans Falls, with the area around the car park a good sites for birding. Green Catbird can usually been seen in the trees immediately above the walks entrance. Mick’s Tower is also a recommended stakeout for the Marbled Frogmouth. The walk to Yerralahla pool (also known as the Blue Pool) is an excellent walk, and a particularly good walk to see Noisy Pitta. I can recommend the Coomera Circuit (17.4 km, 7 hr return to Binna Burra) – or just do the walk to the Coomera Falls Lookout and back, which is approx 10 km. The Lower Bellbird Circuit (12 km return, 4 hr) is also worthwhile, or for a really nice short walk, head down the Border Track, cutting back across to the Coomera Track at Tallawallal (just over 1 km from the start), and then walk back again. Here the track passes through dense rainforest with occasional small creeks crossing the track, and you can seen most of the rainforest specialists birds along this trail. Two birds that often create identification problems due of their similarities are Russet-tailed and Bassian Thrush. The Russet-tailed Thrush is actually more common and widespread than the Bassian at Lamington. The main difference is the white in the tail, looking specifically for the white outer tail feathers in the Russet-tailed Thrush. Only the corners of the Bassian Thrush’s tail is white while the Russet-tailed Thrush has white sides for the greater length. I’ve also found the Russet-tailed Thrush to be slightly more slender than the Bassian Thrush, which can appear plumpish. As a rule, Bassian Thrush inhabited the higher altitudes down to about 850 m, while the Russet-tailed inhabit lower areas, up to 500 m, but sometimes as high as 1000 m. The call also is diagnostic – calling early in the morning, and just before dusk. The Russet-tailed Thrush’s call is pheee-phooo sound, while, to me, Bassian Thrush sounds very similar to a Blackbird. Once you’ve worked at these differences both species start be distinctive and not overly difficult to differentiate. Brown Gerygone. Image Greg Oakley. Duck Creek Rd (4WD) is a good site for drier eucalypt forest (rather than rainforest). Here you may see Glossy Black-Cockatoo, Red-browed Treecreeper, Spotted Quail-thrush, Variegated and Red-backed Fairy-wrens, Painted Button-quail and, in the drier scrubby areas of rainforest (often in association with Lantana), you have a chance of seeing Black-breasted Button-quail and Eastern Bristlebird (very rare this far north). Little Shrike-thrush. Image Greg Oakley. 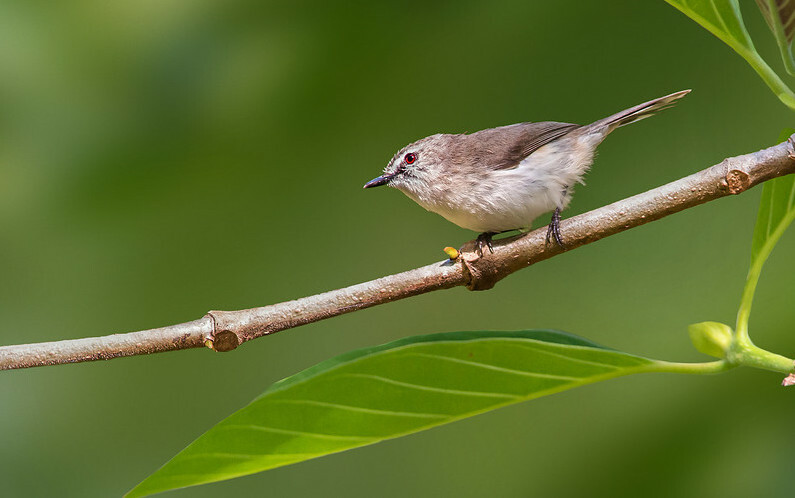 If your keen, spot light for night birds along the roads on your return, looking for the rainforest dwelling Marbled Frogmouth and Sooty Owl, as well as Southern Boobook, Tawny Frogmouth, and Australian Owlet-nightjar. There are also the odd records of Powerful Owl and White-throated Nightjar. Raptors to look for at Lamington include Grey Goshawk (usually the grey morph, rather than white), Collared Sparrowhawk, Peregrine Falcon and Wedge-tailed Eagle. Some of the interesting mammals in the park include the Grey Kangaroo, Red-necked Pademelon, Long-nosed Bandicoot, Sugar Glider, Mountain Brushtail and Common Ring-tail Possum, Common Planigale, Greater Glider, Koala, Large-eared Pied Bat, while Platypus paddle around in the larger creeks. Other animals to be seen at Lamington include Carpet Python, Masked Mountain Frog, Richmond Birdwing Butterfly, Giant Panda Snail and the Lamington Spiny Crayfish, or Blue Mountain Crayfish. This is only found on the Lamington plateau in creek and pools above 450 metres – look for them in the pool at Goorawa Falls, reached via the Coomera Circuit. See below Eremaea’s (www.eremaea.com) complete list for Lamington National Park. Essentially 1 % represents a single sighting. Note also that birds such as the shorebirds and Mangrove Honeyeater were seen Coomabah Lake and the Coomera River. Red-legged Pademelon (Thylogale stigmatica) Common Binna Burra and rainforest tracks. Red-Necked Pademelon (Thylogale thetis) Grassy areas Binna Burra. Long-nosed Bandicoot (Perameles nasuta) Seen at night near the carpark at Binna Burra. Black flying-fox (Pteropus alecto) Small colony along river near Cunungra. Eastern Grey Kangaroo (Macropus giganteus) Farmland in lower areas.